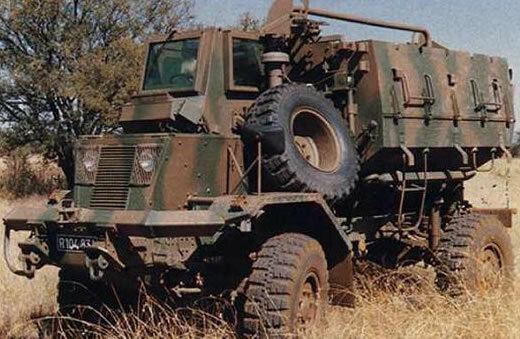 During the 1980’s South Africa developed and manufactured its own series of military supply trucks called the Samil, as the UN had placed sanctions preventing other nations exporting military equipment to the country during the Boarder War. The Bulldog looks much like and has an almost identical layout to that of the earlier Buffel, accept the armoured drivers cab was on the right, had a new radiator layout and used a Samil 20 truck chassis. The Bulldog never entered service with the Army, but was adopted by the South African Air-Force for security patrol work. Production was completed by ARMSCOR and is reported to have commenced in 1982 in some publications, whilst others say 1985.